It’s no secret the Great Barrier Reef is in dire straights thanks to human-caused global warming. But it turns out dramatic upheaval is nothing new for the world’s largest living thing. The Great Barrier Reef has suffered five large-scale die-offs over the past 30,000 years, all of them tied to abrupt changes in sea level or the environment, according to a study published Monday in Nature Geoscience. While this chronicle of death offers a hopeful message that the Great Barrier Reef has bounced back from catastrophe before, it isn’t cause for complacency. As the authors note, the current pace of climate change is pushing the reef into uncharted territory—from which recovery will be difficult, if not impossible. To track the rise and fall of the Great Barrier Reef over deep time, a team led by the University of Sydney’s Jody Webster spent a decade analyzing fossil reef cores collected from 16 sites near the cities of Cairns and Mackay. Examining both geological and biological evidence, they were able to identify five distinct periods during which the reef suffered a major die-back. The first two die-backs occurred prior to the Last Glacial Maximum (LGM) some 30,000 and 22,000 years ago. During this time, the growth of ice sheets caused sea levels to drop, exposing vast swaths of the reef to open air. After the peak of the LGM 20,000 years ago, the glaciers began to retreat in fits and starts, resulting in sudden pulses of sea level rise. Two such pulses overlapped with additional reef die-off events, 17,000 and 13,000 years ago. The rise and fall of sea levels over the past 30,000 years has caused the Great Barrier Reef to become alternatively exposed and drowned. 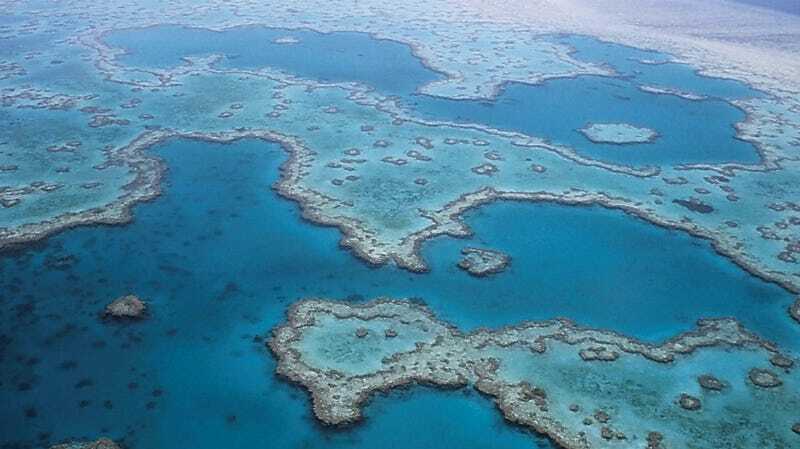 The study found that these spurts of sea level rise were accompanied by large pulses of sediment onto the Great Barrier Reef, leading the authors to hypothesize that the corals were drowned not by water, but by silt and sand. The last die-off event roughly 10,000 years ago also featured a major increase in the sediment load that substantially reduced water quality on the reef. Andrea Dutton, a sea level researcher at the University of Florida who wasn’t involved with the study, praised the authors for their “detailed, interdisciplinary approach,” which she said offers “a robust context for their interpretations.” But she also told Earther that the study cannot be taken as evidence that the Great Barrier Reef will survive the rapid changes it’s currently experiencing, from pollution to rising temperatures to rising acidity. Indeed, as the paper makes clear, the current pace of ocean warming—roughly 0.7 degrees Celsius (1.3 degrees Fahrenheit) in a century—is outside the bounds of what the Great Barrier Reef has experienced over the past 30,000 years. And as recent history has shown, a little extra heat can be a life or death matter for corals. “We can and should use this study to gather the clues to reef resilience through dramatic climate changes of the past,”Georgia Institute of Technology coral researcher Kim Cobb, who wasn’t involved in the research, told Earther via email. “From this study, it seems like the maintenance of diverse reef assemblages and reef terrain were key to the reef’s persistence” in the past.